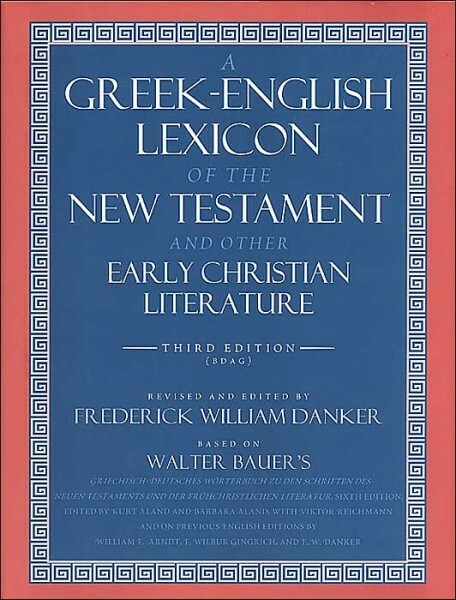 A Greek-English Lexicon of the New Testament and Other Early Christian Literature 3d ed. is generally regarded as the best lexicon of New Testament Greek currently available in English. It is sometimes referred to as the Bauer-Danker Lexicon or simply abbreviated as BDAG. It contains entries for all words occurring in the Greek New Testament as well as most of the words used by the early Church Fathers. The Third Edition is also one of the only lexicons available which attempts to define Greek words in their original context rather than giving only a gloss or suggested translation. This particular electronic edition contains over 80,000 hyper-linked cross-references, allowing the reader to jump easily from a scriptural reference to the passage being referred to. Entries can be accessed via a table of contents or by using Bible Reader's "browse dictionary" feature. Users of The Bible Study App can also jump quickly from a Greek text to the corresponding entry by using the dictionary look-up feature available as part of the Resource Guide. PLEASE NOTE: purchases of this product are non-refundable and are not eligible for coupon discounts. We apologize for any inconvenience.